The State College Area Roller Derby team won in convincing fashion, 209-152, during the last game of the 2018 season on Dec. 2. STATE COLLEGE — Riding an impressive offensive performance, including a 35-point jam by Letter Havoc to start the second half, the Snow Furies defeated Black Ice 209-152 at the Blizzard Battle on Sunday, Dec. 2. 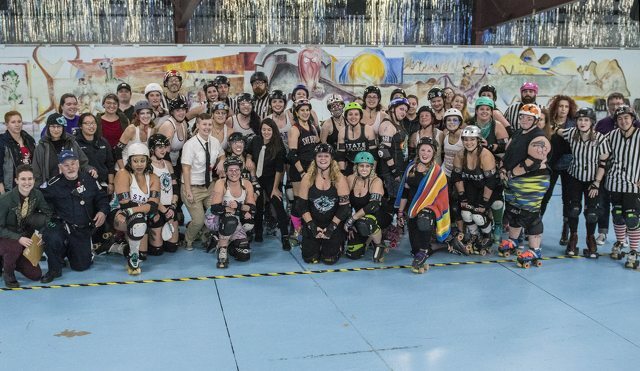 State College Area Roller Derby held the final intraleague bout at Penn Skates to celebrate the end of the 2018 season. For the first time at a SCAR Derby end-of-year bout, former SCAR Derby players that moved and joined other leagues were invited back. Several skaters at Penn Skates on Sunday made the trip from all over the north east including Pittsburgh, Philly, Boston and more. The Blizzard Battle split the league and alums into the two winter-themed teams for the friendly bout. At 5 p.m. the starting whistle blew. It didn’t take long for Ginja Ninja to give the Snow Furies the lead on a big power jam, but Black Ice’s Scott brought her team back within four, 21-17. The teams went back and forth for much of the first half. Through the first 15 jams, Snow Furies led 63-47. The lead opened up over the next three jams as the Snow Furies started to pull away. The score was 93-47 18 jams in and five minutes left in the first half. The Snow Furies passed the century mark in the 20th jam, leading 104-51 and held the lead through the final two jams of the first half. At half time the Snow Furies led 109-56, a healthy lead of 53, but nowhere near safe. In the first jam of the second half Letter Havoc weaved her way through blockers to become the lead jammer. As she did so, Black Ice’s jammer was sent to the penalty bench. During the full two-minute jam Letter Havoc took advantage of Black Ice’s jammer penalties and racked up 35 points for a well-spent power jam. Snow Furies led 144-56 heading into the second jam of the half. Down by nearly 100, Black Ice shifted into the next gear as Zombabe responded in the third jam with 19 points of her own, 145-75. Six minutes into the second half and 55 points had been scored between the two teams. Having turned the momentum around, Black Ice started chipping away at the Snow Furies lead. Three jams later Black Ice had scored 31 more points, 149-106. In the seventh jam of the half, Zorra, a skater from Steel City Roller Derby, jammed for the Snow Furies, breaking up the momentum again with a 24-point jam to widen the lead to 173-108. Black Ice made another comeback attempt in the 11th, 12th and 13th jams, bringing the bout within 50 again, 188-140. With less than 10 minutes left to play, both full teams decided to play a joke on the officials, cramming themselves onto the track at once — earning laughter from fans and officials alike. The Snow Furies crossed the 200-point line with a three-point jam by Letter Havoc and the bout ended after the 20th jam of the second half. State College Area Roller Derby plans to start the 2019 season on Feb. 10, though how the season will open up has not yet been decided. SCAR Derby’s spring Fresh Meat, the recruitment period and training course for those interested in joining the league, will start in the weeks after the opening bout.